Welcome to another challenge starting over at Try it on Tuesday. This time around our theme is a brand new on for me - HATS. The only stamp that I had on hand involving a hat, is a masculine stamp (thanks Cec) so I decided to do another masculine project. I had so much fun doing my steampunk card last week, that I though I would do something similar. This time I threw in a bit of a Western twist with some faux leather. 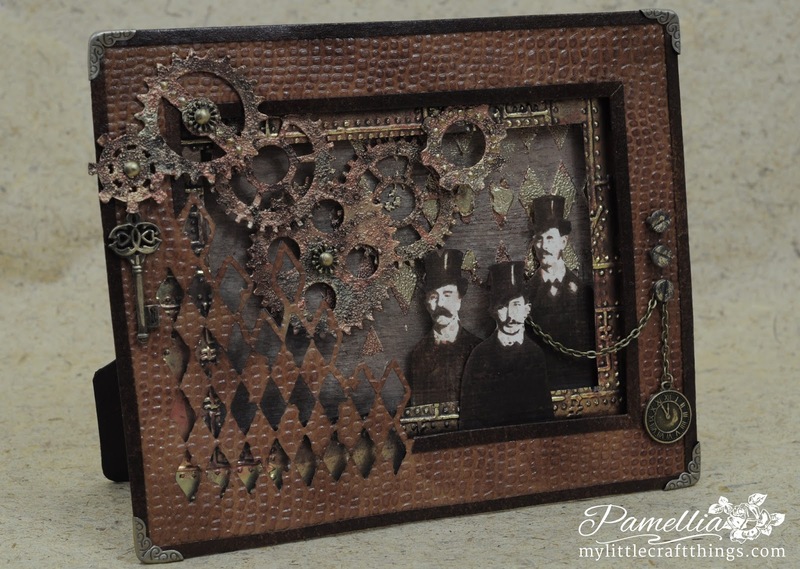 I hope you enjoy my Steampunk meets Western Shadow Box. The stamp is from Tim Holtz. I fussy cut the men into 3 pieces and used foam dots to layer them. 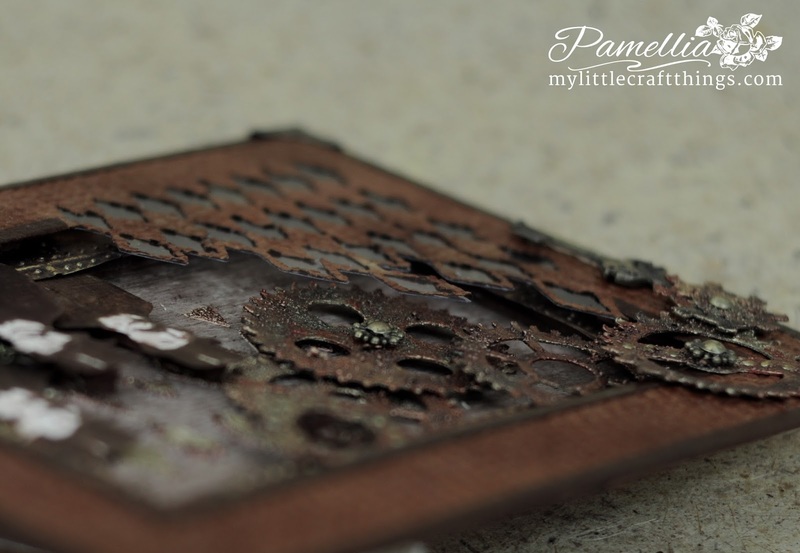 The metal frame was covered in foil and embossed using a Tim Holtz embossing folder and coloured with alcohol inks and dabbed with some Tim Holtz paints. These wonderful gears were cut out for me by my good friend Cec. I used black, copper and gold paints and some embossing powders to give them a grungy look. I used the new Brass Liquid Pearls to add some extra patterns on the gears, and the centers are bead spacers and bronze brads. The frame started as a piece of kraft paper that I coloured using Gathered Twigs, Brushed Corduroy and Vintage Photo distress inks. I embossed it with a Cuttlebug embossing folder and gave it a coating of glossy Glue N Seal. The rims are just strips of paper coloured with distress inks. In the bottom corner, I used the new Tim Holtz Mixed Media die set to cut out this pattern. I put a layer of acetate in behind it to help keep the shape. The backing is a simple woodgrain texture with the harlequin pattern put down with texture paste which I covered with with embossing powder while it was wet. I used Ranger Copper and Queen's Gold embossing powders. WOW! This is amazing Pamellia! Your design is wonderful and all your detailing is absolutely stunning. Wow, this is amazing. The faux leather is fantastic and the Steampunk theme is brilliant. 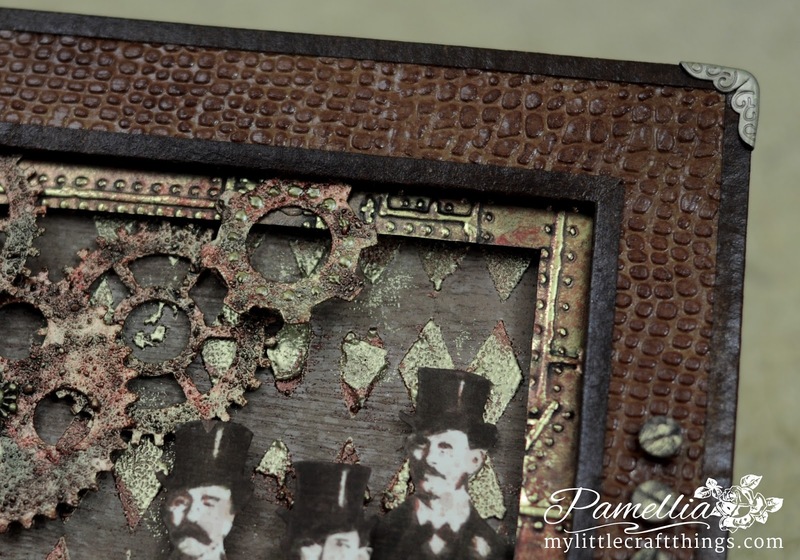 The gentlemen stamp is great and I love the cogs as embellishments. Sally.x. A little different for you Pamellia, but an amazing piece of artwork just proving how versatile you are. Is their anything you can not do Pamellia ?, just love it cogs n all , you are certainly one talented lady. Another AMAZING stunner is this... I love all this textures and the elegant feel that all sourrounds... gorgeous! You made a perfect place for the gentlemen! Now, I get that "like minded" stuff...great job here Pamellia. The leather and metal combo is so macho and you just nailed it here. Hugs. You created a masterpiece here ... I am not a fan of steam punk but I do appreciate an artist when I see one and this is sheer perfection! You are amazing lady! 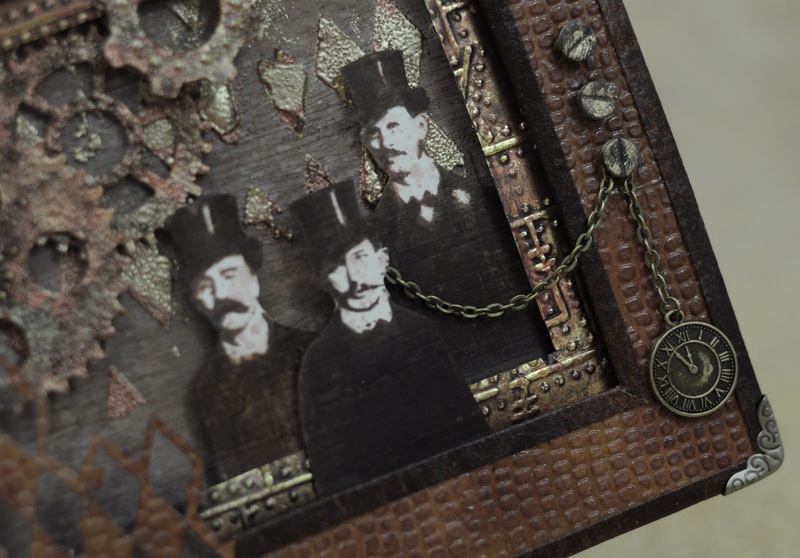 Oh wow, another amazing steampunk project. I just love your metallic effects and the cut out leather looks fabulous. Stunning Pamellia. Oh Good Night!!!!! Pamellia, I'm blown away by this project! What an amazing creation. You've inspired me each time I visit you. Shoot, I can see now I need to buy a couple more texture fades...LOL! What a great masculine project Pamellia!!! Love those rusty clock gears and layered gentlemen! I just got my industrial embossing folder and can't wait to use it, love that metal look you achieved with different inks!! The clock on the chain is such a great touch! Another stunner my friend!! See you on the dance floor! OMG, Pamellia, another stunner from you! I love how you used the embossing folders and inks! This is the awesome steampunk rusty masculine piece of art! I love every detail here! Love. love, love this! Holy cats (or hats, I guess)! This card is one example of textural fabulosity and everywhere I look there is something new to admire!!! GORGEOUS! Love how that die cut harlequin fades right into the corner. I'm still trying to figure out how you did that. Fab, fab textures and layers, Pamellia! Love the layered gentlemen too! Such a brilliant idea! And the faux leather frame is just pefect! 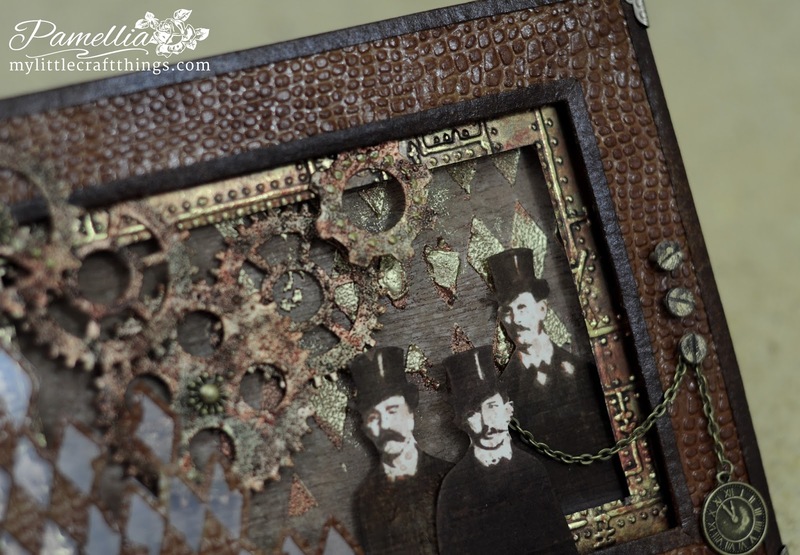 Thanks for sharing this fab steampunk creation with us at SanDee&amelie's! Love the layers and the look to this really cool masculine card! Oh my, I would swear this is real leather! As always, your work is a wonderful collection of textures and techniques. This is absolutely awesome but then everything you do is. Love the frame with the harlequin cutouts and the faux leather look. The gears are transformed fabulously and look so old and grungy and the chain with the watch is such a perfect touch. I can just see one of those old guys pulling it out of his vest pocket. Wow I love this Pamellia. 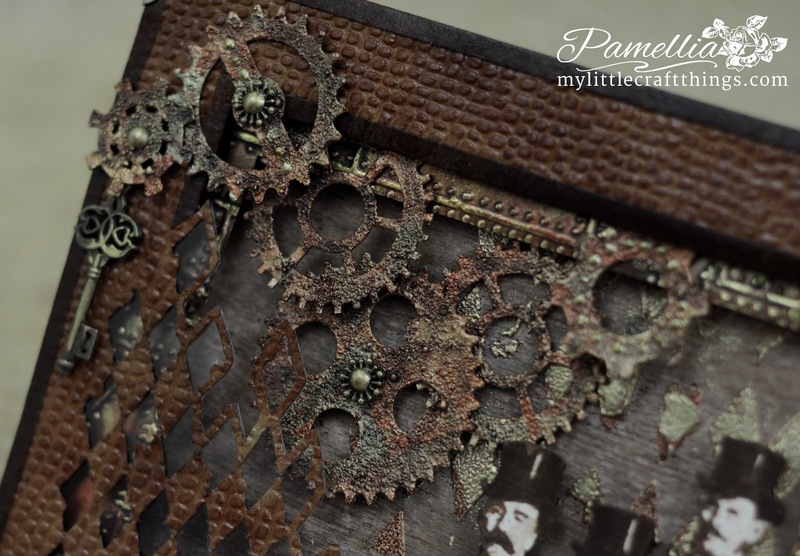 A great steampunk creation, love the cogs and the texture you have created on them. Although I really love this look I have never tried to make anything in this style, I don't know where to start. 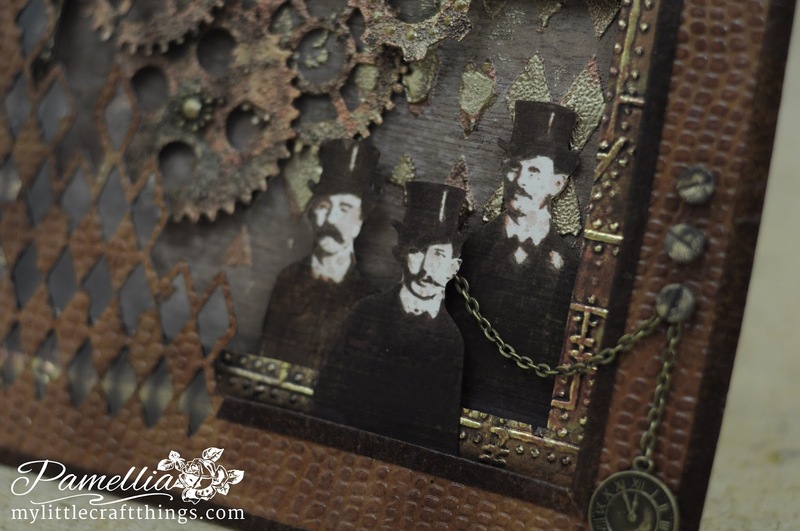 I have however joined an atc swap group and guess what the theme is this time - yes steampunk, so I will have to make something now. Well you have done it again my friend, amazing. Love how you have cut away some of the die cut and backed it with acetate, really looks effective as do your cog wheels wow! Just fabulous! Dear me this is just so cool! I love the faux leather- and the great gears. Loving that corner die you added which adds even more texture. Fabulous my dear! Stunning Pamelia, all the gears looks so real! Pamellia, my jaws fell on the floor! Stunnin g card! I should say: as always! You do Steampunk with such style Pamellia, the design has been so well thought out and I'm sure any gentleman would love this. Thanks for joining in the challenge at A Vintage Journey and good luck. Well, don't they look a motley crew (apologies if you raided the Johnson family album lol!) Love the depth you have achieved on this terrific masculine project. PS. . . . . It wasn't a pre done paper on my card today, it was stamped with Card-io stamps. . . . . and not very neatly lol! This is my absolute favorite piece you have done (as of today)! I knew you would be awesome at Steampunk and am so happy you have given it a go! Hats off to you for a creative piece. Lol! Big Hugzzzz to you Bubbles! Fantastic card Pamellia! Lovin' all the gears and cogs! Brilliant all round, loving the gears but my absolute favourite bit is what you did with those Tim Holtz guys, brilliant, they look fantastic like that!! Gorgeous steampunk work, Pamellia. You are so talented girl! Wow, Pamellia,you have done it again! I am running out of words to comment on your amazingly creative work! I have been going back and forth to look at every amazing detail on this shadowbox, and I just keep finding more and more! It's great to see how you've popped up the mixed media die cut with acetate! Bravo on that engineering! I love how your cut out the guys and layered them--another brilliant move! Of course, all the texturing is just perfect; I had to laugh when you said the background is just simple... NOTHING you do is simple, my crafty friend! Again, my wish is to be in the craft room, learning first hand from THE most talented person I know--and I say that with all sincerity! I'm very humbled by your work--it's like looking up at the stars and realizing how small I really am. I'm very proud to call you my friend, and so proud of all your accomplishments! Big hugs! OMG Pamellia this is spectacular, what an amazing work of art, I do admit that I am not a big fan of Steampunk although I totally love anything vintage, this project is awesome, the images, the texture and detail is brilliant I love it. WOW Pamellia...you sure can wear any artistic hat...ha ha!! This is just one more example of your versatility and so very clever and creative mind!! Well done oh Master of Crafts!!! another of your amazing and wonderfully created creations. You sure are a wizzzzzzzz at creating. Wow! 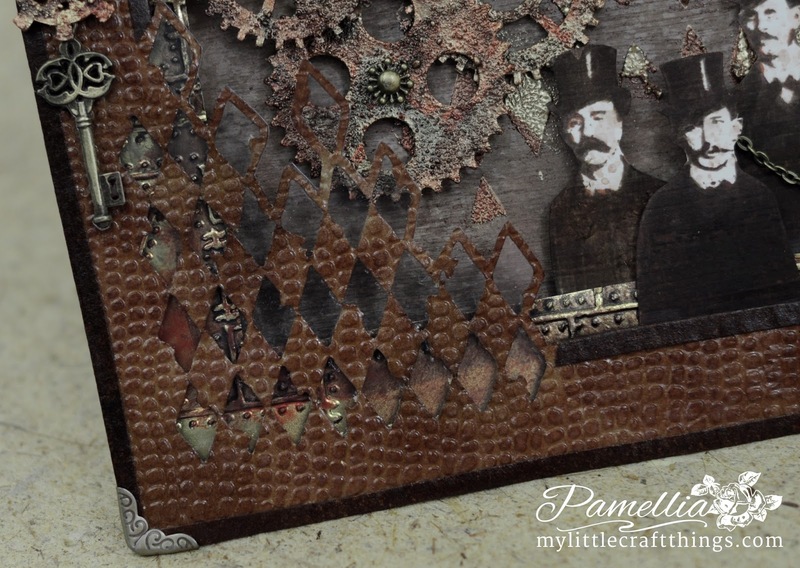 This is spectacular Pamellia, the faux leather is stunning - it looks so much like real leather and I love the Steampunk theme. Your stamp is brilliant, perfect for the challenge and your cogs look so vintage - a fantastic masculine make. Another steampunk masterpiece ! 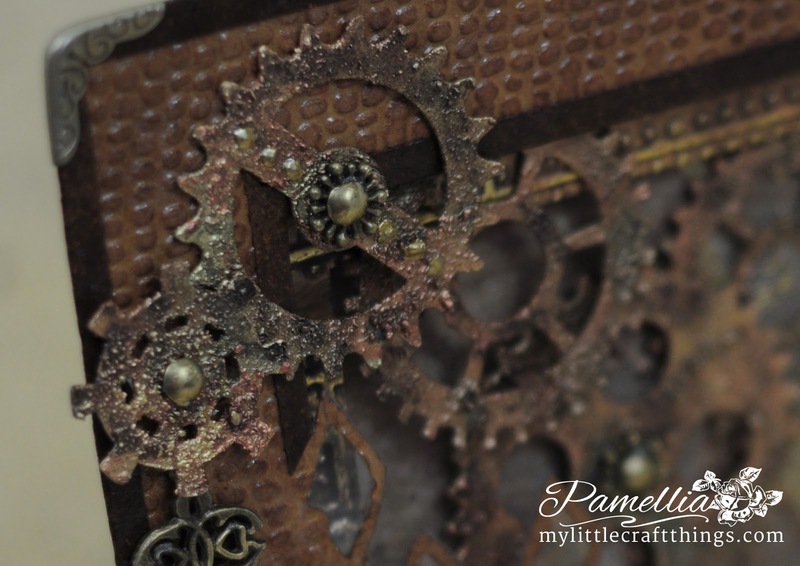 The rusty gears are fabulous and all the texturing in fact ! Wow! This is fabulous, love the depth created with the various frames especially the way you've used the new thinlits (just got these at the weekend). Thats's a wonderful aged effect on the cogs and the faux leather looks fabulous. Just love it all. This is awesome Pamellia!! I love the faux leather and the gorgeous gears, fantastic masculine creation! AMAZING , fabulous, incredible! LOVE it. How does one begin to describe the effect your creativity has on a person??? This is just another example of the many different 'hats' (had to put that one in) that you possess as an artist. EVERYTHING about it is pure brilliance...the acetate backing to the die-cut; the fab little punched, credit card 'screws'; the frames; the 'fob watch; the gears; the placement of the chappies; your use of the bead spacers and brads, etc, etc!! OMG! I've just picked myself up off the floor. I hope my inability to control my sense of balance gives you enough of a clue as to how much I love this project!! You've taken basic paper and transformed it into a magical creation. I can't say enough great things!!!! Wow! Reminds me of the Wild Wild West steampunk movie. 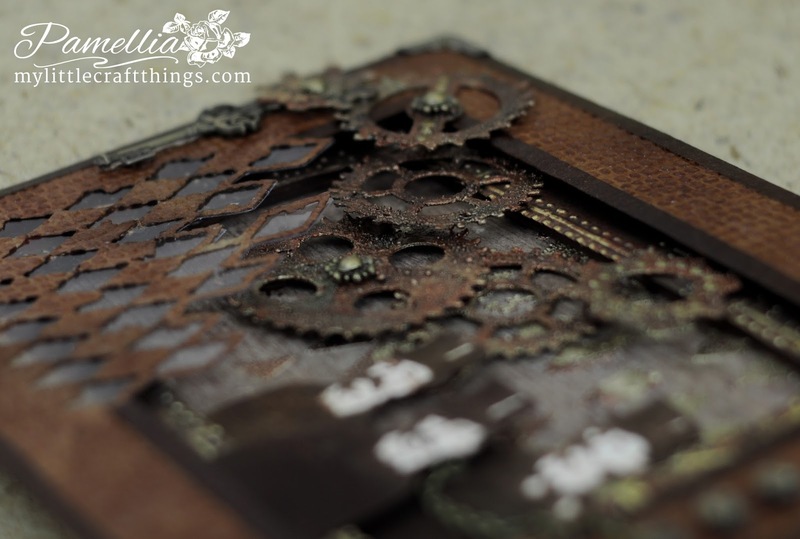 Love the combination of leather and your old rusty looking gears, fabulous textures!Love how you used the bead spacers. Thanks for joining us at SASPC "Gear it Up"! Wow that's so brilliant. Thanks for joining us at Stamping Sensations. Oh you are a rock star with this steampunk fabulousness! I love what you have done and how you used those thinlits! I need them! Hugs! This is so incredible! When it comes to masculine creations I am totally lost without my flowers - you inspire me so much with all this wonderful detail! Oh wow! What a fantastic project- so much detail and texture. Thanks for joining us at STAMPlorations! Amazing steampunk work, Pamellia - it's just stunning. Fabulous layering too to create the 3D shadow box. A great card! fabulous textures! Thanks for joining us at Stamping sensations for our Male theme and good luck! Oh wow, this is stunning! Thanks for joining us over at Crafty Calendar this month & good luck! How lovely you could join the birthday celebrations at AVJ with this amazing frame Pamellia. So beautiful and very creative! I love this....what is the outside dimension of the embossed 'leather" panel and the inside dimension of the foiled panel? I posted this earlier, but didn't see it listed, so am trying again!!! !